Marijuana decriminalization of some form is going to come to New York, and while there’s plenty of well reasoned concern for the effects of marijuana use on public health and youth, it’s high time we got more real about drug use in this country. So big up to Buffalo Assemblywoman Crystal Peoples-Stokes, an early champion and sponsor of New York’s Marijuana Regulation and Taxation Act, which had its day on Monday in the Buffalo Common Council. According to the Buffalo News, Peoples-Stokes countered Erie County District Attorney’s objections (see below) with pointed and effective comments. “I don’t support people smoking cannabis, but here’s a fact: They do,” she said. “They already do, and they do in very big numbers. And they do in numbers so large that there’s already a multiple-billion-dollar industry, but it’s mostly underground. And it does call for the need for guns you want to keep out of the community, because people are protecting turf that they think belongs to them.” Then, responding to marijuana’s role in probable cause vehicle searches: “Law enforcement can smell cannabis in a car, and want to search it, but how many times do they do that after a Buffalo Bills game? Very rarely. But they do it on the East Side of Buffalo. We’ve got to try and find a way to stop law enforcement from wanting to enforce some laws in some communities that they don’t enforce in others.” Amen. The Buffalo Sabres are showing some flashes of their improbable 2005-06 run to the conference finals: a plucky, fun team growing into themselves and loving each other on and off the ice. There are so many young players and high draft picks on the team—Dahlin, Reinhart, Eichel, Mittelstadt—and each one carries with him the ghost of a forgotten season this decade that slowly killed our appetite for hockey one brutal winter at a time. But this young team is burning sage all over this town, and maybe we’ll see some life injected back into the morgue at the foot of Main Street. We’re back in print, which is nice. For that we thank our supportive readers (you know who you are) and our advertisers (who you can appreciate on these very pages). District Attorney John Flynn stepped in some mud Monday during the a hearing on New York’s proposed marijuana regulation legislation in Buffalo’s Common Council. Back in 2016, at a debate for DA candidates, Flynn called Vera Institute and Open Buffalo research on how marijuana policy disproportionately affected minorites “staggering” and even suggested in remarks after the debate that as DA he would urge officers to be lenient when dealing with marijuana. “If I say, ‘Hey, guys, ease up on this, you know, let’s not arrest everyone on sight,’” he told us at the time. “‘Let’s work in some diversion programs and get people out of the criminal justice pipeline and into other avenues.’ They might listen to me. And that’s my hope.” Fast-forward to this week, where Flynn literally said if we stop using marijuana as probable cause for traffic stops, we won’t be able to get as many guns off the streets. Here’s the quote from the News: “I am getting guns off our streets, with these kind of searches. If we eliminate that possibility, I am not going to get numerous guns off the street. I implore you, if this law passes, that there is some kind of carve-out…where law enforcement officers have some ability to be able to search the car and to be able to get the guns off the street.” Flynn is basically asking why there isn’t a carve-out in the Constitution to continue policing minority communities differently. To underscore that, in terms of Flynn’s own worldview, during the hearing he acquiesced that marijuana users are more peaceful than drinkers. “You’re not going to see many bar fights with guys smoking marijuana, I don’t think.” So which one is it, Mr. Flynn? Are weed smokers gun-toting thugs on Bailey Avenue or respectful kids from Tonawanda toking up at a Canalside concert with impunity? Flynn gave the community a free lesson on what implicit bias looks like. Let’s not stop our criticism of local prominent Democrats and their lack of understanding on racial issues there. 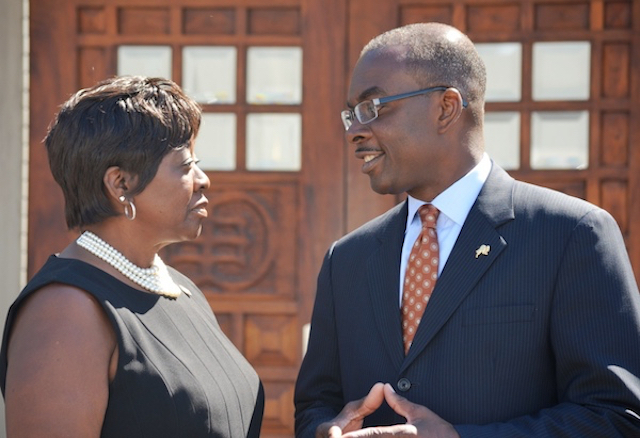 Mayor Byron Brown fired a rare (and calculated?) public salvo at his political opponents, namely Buffalo Comptroller Mark Schroeder and Assemblyman Sean Ryan, who have been critical of Brown’s wayward management of its public housing agency and capital budgeting process (in Schroeder’s case) and the free lunches it doles out to developers (in Ryan’s). In a sit-down with the Buffalo News editorial board, Brown, who called himself the “CEO of the city,” claimed he didn’t get enough credit for Buffalo’s turnaround, that such praise was reserved for Congressman Brian Higgins, County Executive Mark Poloncarz, and Assemblyman Ryan. “I wonder why that is,” Brown said. It’s a weird moment for Brown to grow a sensitivity to racial injustice. Here’s the “CEO” of a city that is being sued by civil rights groups for using putatively unconstitutional checkpoints almost exclusively in communities of color, a city whose police force arrests minorities eight times more than it arrests whites for marijuana, and whose police have killed three young men of color during confrontations with officers since 2017. Now, when confronting criticism that affects his personal political legacy, he wants to talk about racial injustice?